If you're in a fast-moving industry, you need to know about high density interconnect printed circuit boards. If your company isn't using them now, they probably will be soon. 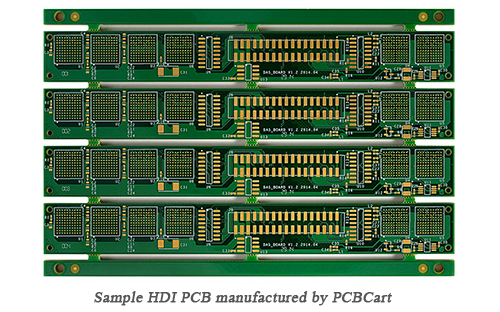 If they aren't, you can be sure your competitors are using them, so you need to learn about HDI PCBs and their benefits fast. High density interconnect PCBs are a way of making more room on your printed circuit board to make them more efficient and allow for faster transmission. It's relatively easy for most enterprising companies that are using printed circuit boards to see how this can benefit them. The evolution of high-density PCB technology has given engineers greater design freedom and flexibility than ever before. Designers using HDI high density interconnect methods now can place more components on both sides of the raw PCB if desired. In essence, an HDI PCB gives designers more space to work with, while allowing them to place smaller components even closer together. This means that a high-density interconnect PCB ultimately results in faster signal transmission along with enhanced signal quality. HDI PCB is widely used to reduce the weight and overall dimensions of products, as well as to enhance the electrical performance of the device. The high-density PCB is regularly found in mobile phones, touch-screen devices, laptop computers, digital cameras and 4G network communications. The HDI PCB is also prominently featured in medical devices, as well as various electronic aircraft parts and components. The possibilities for high-density interconnect PCB technology seem almost limitless. HDI PCBs are appropriate for a wide range of industries. As mentioned above, you'll find them in all types of digital devices, like smartphones and tablets, where miniaturization is key to the effective application of the product. You can also find high-density interconnect PCBs in automobiles, aircraft and other vehicles that rely on electronics. One of the most critical areas where the high-density PCB is making huge inroads is in the medical arena. Medical devices frequently need small packages with high transmission rates that only HDI PCBs can supply. For example, an implant needs to be small enough to fit in the human body, but any electronics involved in that implant absolutely must efficiently allow for high-speed signal transmission. Here, the HDI PCB indeed is a godsend. HDI PCBs can also be useful in other medical equipment, like emergency room monitors, CT scans and much more. No matter your industry, you're probably already getting some ideas about how high-density interconnect PCBs can make the electronics you produce or use even better - get in touch with us PCBCart to discuss it. We'll let you know if you're on the right track and help you decide exactly how beneficial an HDI PCB can be to your industry. Then, you can determine whether or not to take the next step. Over the course of a decade in business, PCBCart has established a hard-earned reputation for manufacturing PCBs of the highest quality. Our custom PCB manufacturing capabilities enable you to get the finest quality HDI PCBs at competitive prices without min order quantity requirement. Our team run design for manufacture check on your custom PCB file and consult with you to ensure it is ready for manufacturing and that your boards will meet your performance requirements. We also have an on-site quality control department to verify the finished product meet your high quality standards. Our Online PCB Quote and Order System allows you to get HDI PCB production price within seconds. Click below button to enter our HDI PCB quote page, then fill in your circuit spec (it is crucial that you select YES under Laser Drill option, and choose the right number under Type of stacked/staggered microvias section), corresponding HDI PCB price will show up in the right column. If your high-density PCB project requires specifications not listed in the above table, feel free to reach us for solutions.